8-CD box set, showcasing three complete shows – fully mastered soundboard recordings, with six sets of music, featuring seventy-eight unique songs with three special guests. Recorded Live February 19th, 20th and 21st, 1993. This run at the intimate Roxy Theatre in Atlanta, Georgia set the stage for many classic tripartite celebrations to follow. With the second show's near-instant legendary status cemented among fans due largely to a non-stop thriller of a second set which included feats of rock and roll greatness, including a sit-in by a spurious Gene Simmons, At The Roxy captures a magical moment for Phish and their audience during a period of peak songwriting and experimentation. Over three nights, the band showcased the full spectrum of their talents from ballads to blues, from master composition to fearless improvisation all simmered and served to a small crew of jubilant participants in a near perfect environment. At the same time, the quartet was experimenting with their acoustic, bluegrass side that peaked over the next several years and provided a perfect baffle to the intense, psychedelic rock of Rift-era Phish. 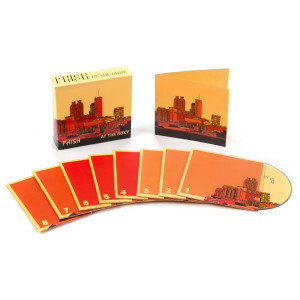 The 8-CD box set is the first complete multiple-show release since Hampton Comes Alive and the 1998 Island Tour. This is magic. If you don't own it you should change that fact immediately. Must listen magic! I love this set because it captures the band at a time when they were blending tight playing, improvisation, and silliness - and doing them all well! One small caveat/note: the vocals can sound like they were recorded in an echo chamber. My guess is that there was a bit of reverb added for the show and it made it on to the DAT. I only really notice it when the vocals are prominent within a song. It may bother you, so I'd suggest listening to a track before ordering.